There’s a lot to think about when you’re going to propose to your girlfriend or boyfriend. Not only do you have to worry about getting a ring (we recommend an antique engagement ring), you also have to make sure you’re ready and figure out a romantic way to propose. We’ve come up with some memorable proposal ideas that will increase your chances of getting the answer you want. 1. Propose in a meaningful location. Take some time to think about milestone moments in your relationship. Did you go somewhere special on your first date? Were you on vacation when you first realized you were in love? Return to a place where something significant happened in your relationship. 2. Capture the moment on video. While at a scenic location, bring along a camera and tripod. Stage the proposal by saying you want to get a photo of the two of you and that you’ll use a timer to snap the shot. Instead of setting a timer, turn the video setting on and record this clever outdoor proposal. 3. Pop the question in public. 4. Spell out the proposal. If you find that you have trouble coming up with words to express how you feel, take the pressure off yourself by spelling out the proposal, literally. For instance, you could spell out “will you marry me” in scrabble pieces or write the message in the sand. If you plan to combine the proposal with a party, spell it out in letter balloons. Make a sign on posterboard if you have to! 5. Nest the ring in several boxes. If you want to attempt a fake-out proposal, do so on a birthday, anniversary or holiday. This way you can use the gift exchange as a cover-up for the proposal. Hide the ring in a large, inconspicuous box and have your soon to be fiance find the ring that way. You can also nest the ring in several boxes, but your partner might catch on to what’s happening after opening two or three boxes. Keep your cool until the final moment. 6. Hide the ring in plain sight. Take caution with this idea because we’ve had customers lose rings or forget where they hid them. Think about something that your partner often does. Do they make coffee every morning? Then hide the ring on top of the coffee grounds temporarily (don’t leave it there!). If your partner practices yoga every morning, tie the ring to the mat holder. 7. Incorporate something you’re good at doing. What skills do you bring into the relationship or to life in general? Are you a fantastic and creative writer? Write a poem. Do you like to build models? Build a miniature model love scene. Do you love to cook? Cook her favorite meal and pop the question during dinner. 8. Involve family and friends. It may take a village to raise children, but it can also take a village of encouraging people to have a happy and healthy relationship. If you are both really private, skip this proposal idea. However, if you are close with family and friends, make them a part of the process. Have them sing, dance, act out scenes from a prized movie… whatever it takes, they’ll likely be thrilled to help out. 9. Create a treasure map of your relationship. This proposal is a twist on a scavenger hunt. Draw out a map and take your partner on an adventure through various stages of your relationship. Look into your past together to prepare for a bright and happy future. If you want to hide the fact that you’ll be proposing, suggest going on the adventure on an anniversary just as something fun to do. 10. Put the family pet or child to work. While it might not be necessary to involve extended family and friends on this occasion, it is extremely thoughtful to include immediate members of the family like children or pets. For children, let them brainstorm ideas to encourage their creativity and ease the transition period. 11. Propose in a high-adrenaline situation. Emotions naturally run high during a proposal, but you can really enhance the memory by doing something out of the ordinary that gets your adrenaline pumping. Propose while on a rollercoaster, a zip line, a hot air balloon, or while climbing a mountain. Maybe you propose while inside an escape room? Just be sure whatever you do, you’re safe while doing it. 12. Set the scene for romance. Regardless of where you plan on proposing, a little staging goes a long way. You don’t want your partner to feel like the proposal was an afterthought. Careful placement of candles, roses, and dim lighting make all the difference. This is not an everyday moment, so set the environment apart from the everyday. 13. Plan to propose impulsively. 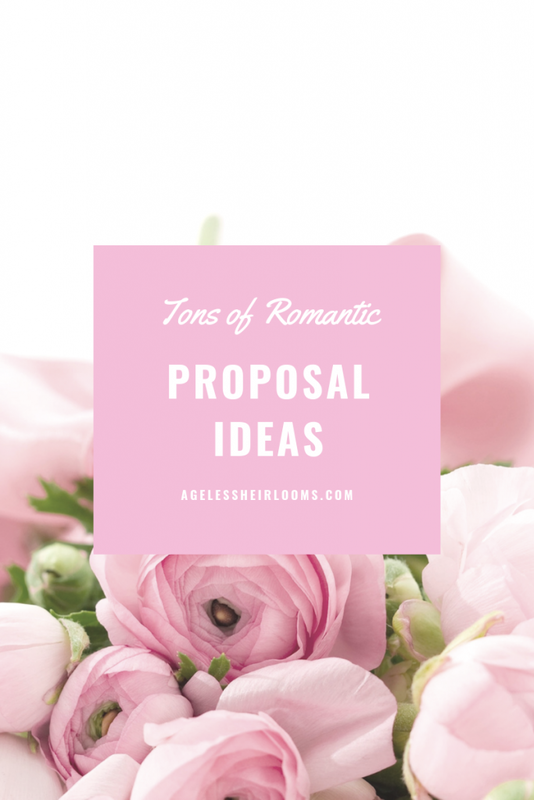 Seeing all these over-the-top proposals on the internet can be intimidating. However, sometimes the best proposals are on the spur of the moment. If you tend to get nervous, make a plan to propose when you feel the time is right. Keep the ring on hand and go with your gut. If you are authentic and in love, even an ordinary proposal can be incredibly romantic. 14. Use the internet to your advantage. While we don’t suggest proposing in a text message, the text could be a way to drop hints or get the ball rolling. You can also use social media, YouTube, custom playlists on Spotify, or GIFs to enhance the overall impact of the proposal. 15. Don’t be afraid to get emotional. Use your words to explain how you’re feeling. It’s easy enough to say the words “will you marry me” but challenge yourself to express the sentiment in the moment. Try to write down some ideas in advance and practice! By practicing expressing your emotions beforehand in words, you’ll be more likely to contain yourself and get the thoughts out without crying uncontrollably. And hey, if you do, that’s okay, too. Did you already propose and want to share? Let us know how you proposed in the comments below.